There were multiple sightings of gold at the Nanaimo River last week – but not the precious metal. More than a dozen dogs took part in Pooch Pack Adventures’ fifth annual "Golden Retriever Roundup" at the river Wednesday. Owner and dog-walker Kim Sirett, whose personal dog is a golden retriever, said she wanted to create an event with the “no barking, happy, tail-wagging” breed because she walks so many of them. So she piled 13 of the dogs – and one lucky yellow Labrador retriever – into a van and took them to the river for a massive game of fetch. Sirett said she loves all her dogs, but has a soft spot for the breed because she grew up with one. “They’re just a really good family dog and always happy, and willing to please,” she said. 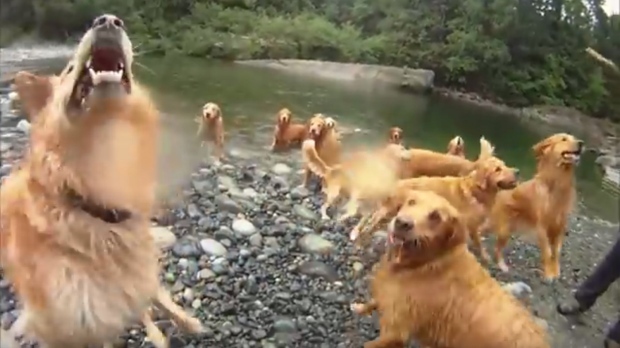 It made for a great video, but do the dogs notice when they’re all together? Sirett thinks so.